The Sentry E. Labs 2083EJ electric door strike requires the use of an additional control device that will allow the lock to remain in the unlocked position. With this door strike you will be able to electronically lock and unlock doors that utilize standard non-automated spring latch handles with a max height of 1 and 3/4 inches. This electric door strike is compatible with doors with standard handles and will be able to remotely lock or unlock these doors with the use of a key pad or similar device. The 2083EJ electric door strike was designed to be used with both metal and wood frame doors. This strike can be installed on both right and left opening doors. This electric door strike requires a 12v DC power source. The Sentry E. Labs 2083EJ is a fail-safe electric door strike . When there is a loss of power the door strike will allow the door to become unlocked and not allow people to become trapped in interior offices during a power loss. The 2083EJ must be paired with an access control device to regulate the amount of time the lock is the open or unlocked position. These devices include: keypad, proximity card reader, GSM intercom, GSM receiver, automatic door opener, and a timer. These above listed items will be regulate the time needed to unlock and open the door. With those devices you add the following accessories aid in the unlocking of the door. These accessories will connect to the access control device and then connect to the electric strike . 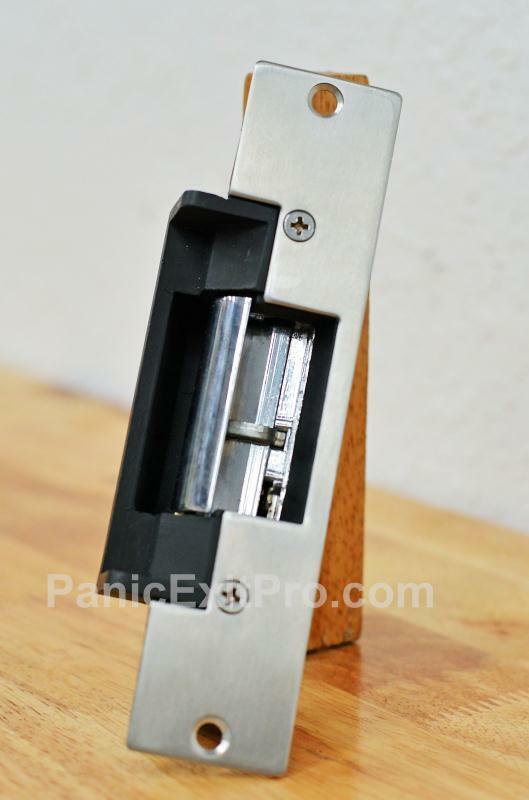 You can choose to add: push button, IR hand sensor, micro-switch panic exit bar, switched handle, and a fire release. The lock notch has built in sensor that will detect the presence of the door latch. This can be used to security systems to determine if the door is in the locked or unlocked positions. This sensor however will not determine if the strike is engaged or disengaged. There also a built in switch that acts as a bypass that will keep the strike in the unlocked position. The lever that is actuated by the switch does not allow the relay to engage the locking pin on the strike . The Sentry E. Labs 2083EJ electric strike was designed to used as a fail-safe door strike . In the case of an emergency and there is a loss of power, people will not become trapped in their interior offices and will be able to evacuate the building. When the access control device interrupts the power going to the either normally closed or normally open dry contact, the strike will be able to be pushed into the body of the strike . This will allow for the door to be opened by either pushing or pulling on the door. The reason a access control device is needed, is that you need a device with a time delay built in to keep the relay open on the electric strike itself. If you were to only use a push button and no access control device, the door will only remained unlocked for the duration of the button being depressed. Once you release the button the door will become locked. The use of a device with a time delay will allow for the proper time needed to unlock and open the door.